LOS ANGELES — In Disney’s animated classic Sleeping Beauty (1959), Princess Aurora is cursed to fall into a death-like sleep on her 16th birthday. Maleficent, the fairy and mistress of all evil, applied the spell in anger after not being invited to the royal christening. Forty-five years later, Disney has released a live-action feature that gives movie audiences another perspective on the fairy tale. 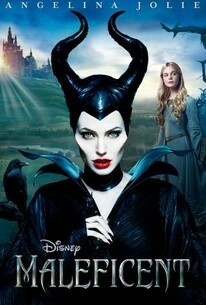 Angelina Jolie plays the lead role, with special effects make-up enhancing her already angular facial features. Visual effects also play a large role in helping to tell the story, which spans the evil mistress’s lifetime. Robert Stromberg, who received Academy Awards for Production Design for his work on Alice in Wonderland and Avatar, directed the VFX-heavy feature, which also stars Elle Fanning as the young Princess. Digital Domain and MPC handled the bulk of the visual effects for the feature, working with the film’s VFX supervisor, Carey Villegas. 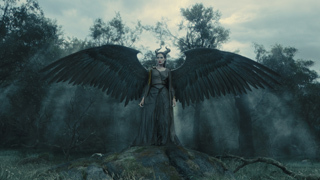 Here, Digital Domain’s VFX supervisor Kelly Port details some of the studio’s work on 540 shots, which range from digital environments and creating the fairies responsible for protecting Princess Aurora, to the wings of Maleficent herself. 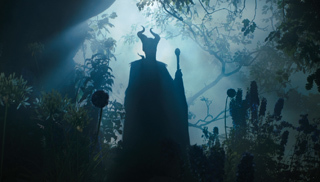 POST: What were Digital Domain’s VFX contributions for Maleficent? POST: Why was there a need to have digital doubles? POST: Can you talk about the environments? 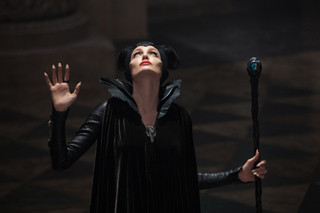 POST: Maleficent is a 3D film, but it wasn’t shot in 3D? POST: What other visual effects were Digital Domain responsible for? PORT: “I hate to say ‘the group I’m most proud of,’ because I am proud of it all, but the most technically-challenging and rewarding for us were the three pixie hero characters we worked on. You see them in the first act of the film. They are small pixies, about one-third the size of a human. These are the ones that were tasked by the King to take care of Aurora until she reaches her 16th birthday. And when they are tasked to do that, they transform into their live-action, full-grown selves. There are three of them played by three amazing actresses: Imelda Staunton, who plays the Knotgrass; Lesley Manville, who plays the character Flittle; and Juno Temple plays Thistletwit. In the second act of the film they are live action, but in the first and third, they are pixie versions of themselves, so right off the bat, it was critical that there were similarities that could call back to the live-action versions of themselves. We wanted to ‘pixify’ or [add] some slight stylization, but maintain a very photorealistic quality. POST: How did you manage it? POST: You must have needed access to the talent early on? POST: How was the work split up between Digital Domain’s Los Angeles and Vancouver facilities? POST: How much manpower did you have to allocate to this film? POST: When did you get involved? POST: Were the VFX scenes shot against a blue screen? POST: What were they shooting with? POST: How many shots was Digital Domain responsible for? POST: You must have an established toolset for a film workflow? POST: Were the pixies the biggest challenge on this film?